What are the benefits of a professional multi-GPU system? NVIDIA® Maximus® technology transformed the design process by combining the industry-leading graphics capability of NVIDIA Quadro® graphics processing units (GPUs) and the high performance computing power of NVIDIA Tesla® GPUs. 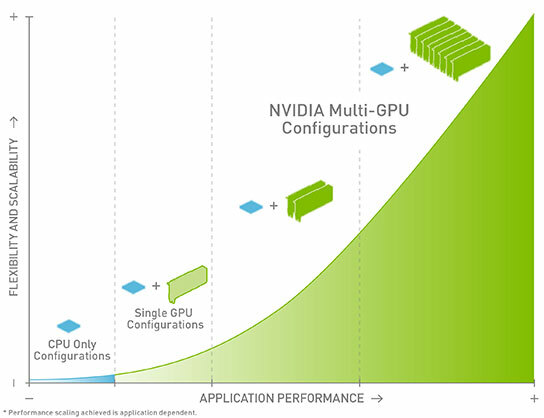 NVIDIA Multi-GPU Technology builds on this capability by leveraging any combination of Quadro and Tesla GPUs to intelligently scale the performance of your application and dramatically speed up your production workflow. This delivers significant business impact across industries such as Manufacturing, Media and Entertainment, and Energy Exploration. Substantial time savings—A multi-GPU system helps address the pressures of delivering a high-quality product to market more quickly by providing ultra-fast processing of your computations, renderings, and other computational and visually intensive projects. Faster iterations—The ability to revise your product multiple times in a resource and time-constrained environment will lead to a better end result. Completing each iteration of your automotive design, animation, or seismic data processing faster leads to additional refinements. Based on the NVIDIA Kepler™ architecture, a multi-GPU system provides more than just performance gains. It also gives you the freedom to run your applications with full features and effects enabled. This includes real-time ray tracing and global illumination.